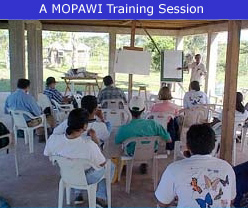 MOPAWI (Mosquitia Pawisa-Development of La Mosquitia) is a non-governmental indigenous grass-roots development and conservation organization that has been working throughout the Mosquito region of eastern Honduras since 1985. MOPAWI’s mission is “to support integrated human development and nature conservation”. MOPAWI’s integrated conservation and development mission for the entire region of La Mosquitia includes the following program areas: sustainable agriculture, community forest development, preventative health, bi-lingual-intercultural education, organizational strengthening, lobbying and advocacy, institutional strengthening, small business/credit, coastal marine management, and integrated management of the Río Plátano Biosphere Reserve. MOPAWI has actively supported ECOS Río Plátano and the scholarship program by participating in the board of directors, lending logistical support with communication and administration, and reaching out to potential donors. The support and collaboration of MOPAWI in the early years of ECOS Río Plátano will be critical to develop a self-sustaining organization capable of implementing our long-term mission. EcoAdventures La Mosquitia, located in La Ceiba, is the only company that provides both single day and multiday tours in the Río Plátano Biosphere Reserve. They provide ECOS Río Plátano with support in promotion of our organization as well as in solicitation of donations.